It used to be – and probably still is – popular for school boards to allow schools to teach elective courses on the Bible, which of course is legal as long as they are “taught academically, not devotionally”. In practice, however, the distinction is often – shall we say – “blurry”. One of the central promoters of such courses is The National Council on Bible Curriculum in Public Schools (NCBCPS), which has lobbied school boards to not only teach such courses, but also tried to sell them their own textbooks for such classes. The NCBCPS’s textbooks are, as expected, designed not merely to teach students about the Bible, and are riddled not only with falsehoods and errors, but the kind of fake news memes you’ll find on crazy conspiracy theorists’ facebook pages stated as facts, such as citing alleged NASA findings that suggest that the earth stopped twice in its orbit (nope) as evidence that the Biblical description of the sun standing still in Joshua and II Kings as a literal truth. The curriculum would also quote approvingly from Christian Nation apologist David Barton and claim that the Bible was “the blueprint for the Constitution,” which suggests that they have neither read nor care too much about the Constitution (other than in this sense, of course), which is not very surprising. Tracey Kiesling is (or at least was) the NCBCPS’s national teacher trainer. In her course she offered “scientific documentation” on The Flood and cited Carl Baugh as a scientific authority – “an internationally known creation scientist who founded the Creation Evidence Museum in Glen Rose, Tex,” according to Kiesling, and whose promotion of the Paluxy footprints as evidence for young-earth creationism has made him shunned even by the more batshit crazy factions of the young-earth creationist movement. Currently Kiesling is promoting a weight-loss scheme, T-tapp. 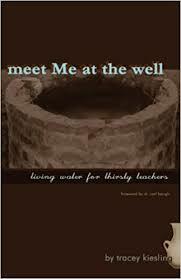 She has also written a book called Meet Me at the Well: Living Water for the Thirsty Teachers. We recommend neither. Diagnosis: Not a reliable source of information about absolutely anything. Stay well away.